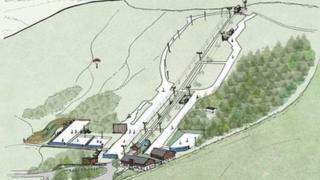 Britain's longest dry ski slope is to have a £500,000 revamp including an extra 210 metre piste and a new nursery slope. The Midlothian Snowsports Centre at Hillend will also have new, safer ski matting at its existing nursery slope, snowtubing runs and two new lifts. Sportscotland, the national agency for sport, has provided the funding. The centre had been threatened with closure after Midlothian Council said it could no longer afford to fund it. However earlier this year Sportscotland and the Scottish government stepped in with £1m of funding to secure the site's future. The fight to save the centre, also known as the Hillend ski slope, was the focus of an internet campaign supported by more than 27,000 people. Russell Imrie, Midlothian Council planning committee chairman, said: "This time last year the facility was looking tired but this investment will give the centre a considerable makeover. "We also hope that the private sector will join us in looking at investment and business development opportunities to help make Midlothian Snowsports Centre a national tourism gateway." Derek Milligan, Midlothian Council's leader, said: "We know there is huge enthusiasm out there for the centre and these improvements will offer something for everyone, whether it's snowtubing, learning to ski on the new, safer nursery slopes or choosing a different slope from the top of the chair lift. "We expect customers to be able to use the existing facilities and slopes as normal throughout the winter. "We hope these exciting plans for this national facility will have a positive impact on snowsports for people across the country by helping to maximise the full potential of the site. "However the long-term future of the centre relies on a commitment by the Scottish government to provide ongoing national funding."